Shopping for Star Wars Artwork? Artwork inspired by Rogue One: A Star Wars Story. Limited edition of only 95 hand-numbered pieces! Canvas print measures 36-inches wide x 20-inches tall. 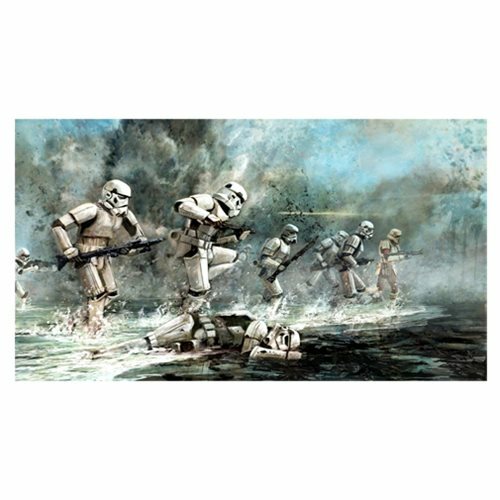 Interpretive artwork inspired by Rogue One: A Star Wars Story, this captivating Star Wars Storming Troopers by Cliff Cramp Canvas Giclee Art Print is a limited edition of only 95 hand-numbered pieces, signed by artist Cliff Cramp. The marvelous unframed giclee on canvas measures about 36-inches wide x 20-inches tall and comes with a certificate of authenticity. Note: Item comes rolled and packaged in a cardboard tube. Giclee (pronounced "zhee-clay") is an invented name for the process of making fine-art prints from a digital source using inkjet printing. The word was coined to distinguish commonly known industrial "Iris proofs" from the fine-art prints artists were producing on the same printers. The name has since come to mean any high-quality inkjet print and is often used in galleries and print shops to denote such. In the past few years, the word (as a fine-art term) has come to be associated with prints using fade-resistant "archival" inks and the inkjet printers that use them. A wide variety of substrates are available, including various textures and finishes, such as matte photo paper, watercolor paper, cotton canvas, or artist textured vinyl. Ages 15 and up.